"We didn't want to improve it to the point that it was just another suburban park," a county official said of the project. "We wanted to keep the feel of being lost in nature." Norb Lion stared at the map hanging at the Crystal Lake Park entrance on a sizzling day last week. He and his 7-year-old grandson, Larry Hart, wanted to go fishing but quickly realized that reaching the freshwater lake might require a hike through some rugged woods, and perhaps navigation skills. Off they went, leaving their nets behind, disappearing into the newly reopened Burlington County park to explore its five miles of twisting trails. "Did you see that ravine?" Lion, of Roebling, asked when they emerged an hour later from the 370-acre park, the largest of nine that the county has developed over the last four decades. They had found not only a perfect fishing spot for a future day, but a bit of unexpected terrain. Seventy-five-foot cliffs and ravines aren't exactly common in South Jersey. A few minutes later, two more hikers appeared, but this pair was carrying trekking poles and a backpack. "If you want to hike hills in South Jersey, there's some really good ones back here," Ed Bish, of Pennsauken, said. Grace Page, of Westampton, ticked off the wildlife they had encountered: deer, turtles, fish, a blue heron, an egret, and a blacksnake. 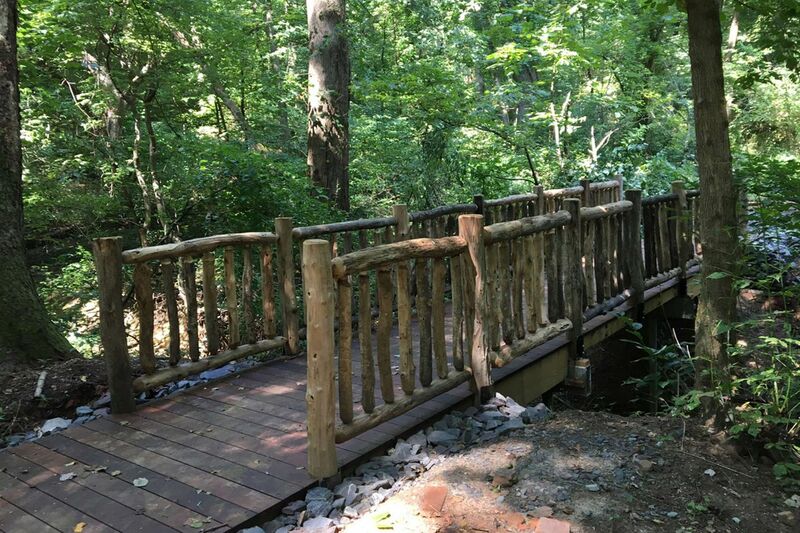 The county completed a $2.6 million development project last month that added about four miles of trails to the park, tucked into Mansfield Township. Many are unmarked dirt paths that bend and dip through upland and lowland forest. Care was taken during the nearly yearlong project to leave much of the park in its natural condition, according to Mary Pat Robbie, director of the county's Resource Conservation Department. "We didn't want to improve it to the point that it was just another suburban park," Robbie said. "We wanted to keep the feel of being lost in nature." The ravines were created decades ago when the area was mined for clay used to manufacture bricks, she said. "A lot of this was man-made . . . and there are 75-foot drops," she said. At the entrance off Axe Factory Road, new picnic tables, barbecue grills, and restrooms were added to the park. A special horse mounting area for riders and dedicated parking spots for horse trailers are another new feature. Matt Johnson, the county's park development coordinator, said the mounting platform accommodates disabled riders who can access it with wheelchairs and then be helped onto a horse for therapeutic riding. He said other riders may also prefer to use the platform because this type of mount puts less stress on a horse's back. Crystal Lake Park also offers the most riding trails, among the other parks in the county, Johnson said. "The trails are all multiuse, for hikers, bikers, and equestrians," he said. "Depending on a rider's ability and a horse's disposition, there are some trails with extreme topography." He said some of the trails also offer a challenge to mountain bikers. Starting next year, another project will open up the park to on-road bicyclists, roller-bladers, and walks. One of the flatter trails, on the edge of the park, will be paved for bicyclists, roller bladers, and walkers, Johnson said. The 10-foot-wide path will be linked to the 60-mile Delaware River Heritage Trail, a long-range plan to connect 24 towns in New Jersey and Pennsylvania. Most of the paved path will run along farmland and meadows, but a small segment dips through a wooded area. The rest of the trails will be left alone, Johnson said, noting that ruts were filled in, as part of the project, and some surfaces were stabilized and provided with erosion controls. Bish and Page, who are with the Outdoor Club of South Jersey, said they understand the desire to make some trails accessible to the disabled and to create bike paths. But they were glad to hear most of the park will remain natural. "This is the closest thing to the Poconos," Bish said. "There are some good hills to practice climbing."